Making your own Christmas cards doesn't get any quicker or easier than this! Glue and 3D foam pad. 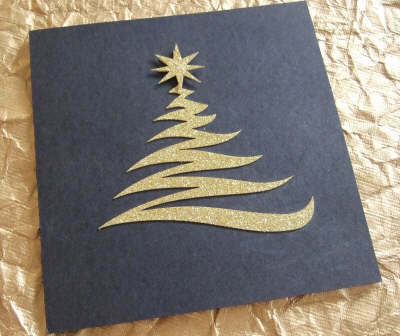 Just stick the zig zag tree to the card blank and top with a gold star and you're done! This is a really quick and very simple card to make. Perfect if you want to make a batch of similar cards. 1. 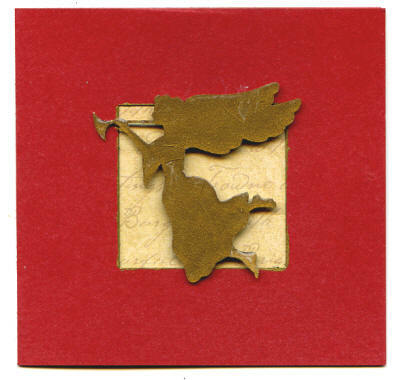 Put a scrap piece of paper inside the card and carefully draw a fine line around the edge of the aperture with gold pen or ink. 2. Cut a square of the backing paper to 85mmx85mm and stick with double sided tape to the inside of the aperture. Remember that you need the patterned side to show through the aperture. 3. Carefully cover the front of the angel with Versamark ink and sprinkle with embossing powder. Shake off the excess and heat the angel with the heat gun to melt the powder. Repeat this step twice more and you should have a beautiful, triple embossed embellishment. 4. Attach a few double sided mounting pads onto the reverse of the angel and position in the centre of the aperture. If you don't have the necessary supplies to emboss the angel you could leave it undecorated or use a product such as Glossy Accents to give it a little dimension.